A friend and fellow cigar enthusiast recently told me that he won’t smoke “anything less” than a full-bodied cigar. To me, the designation “anything less” seems a bit ridiculous in such context—every bit as silly as if I’d claimed not to drink “anything less” than a cabernet sauvignon, or eat “anything less” than dark chocolate. “Anything less” implies a degree of quality, and we should not confuse quality with strength. It’s true that many of the finest cigars available happen to be full-bodied cigars. It’s also true, however, that many are medium- or even mild-bodied sticks. Davidoff, for instance, has long been one of the finest cigar brands available, and the company specializes in milder stogies. You’d be hard-pressed to argue that a milder Davidoff is inferior to a fuller cigar of lesser craftsmanship and flavor. Many of us like to say we “graduate” from milder to fuller cigars as we delve deeper into this shared hobby of ours. Be that as it may, let’s not forget that milder cigars can and should remain part of a well-balanced collection. We should not consider ourselves too macho, too old, too cool, or too proud to smoke mild or medium sticks. In fact, I’d argue that one sign of a truly sophisticated connoisseur is the ability to appreciate sticks of all vitolas, wrappers, strengths and bodies. Such an aficionado may have his favorites, but he is always trying out new stogies and never turning them down on the basis of style alone. I’m not suggesting that you force yourself to endure mild sticks if you absolutely don’t like them. But at the same time, I ask that you not conflate mildness with low quality, or fullness with high quality. Quality and body are two very separate things. I encourage readers to share some of their own favorites as well. Gotta throw the Montecristo White in there and also the Ashton Classic and Macanudo Gold Label. Three of my favorite mild smokes. What I have exerienced through my 3 years of smoking is that I have finally developed the taste to appreciate milder cigars. When I first started smoking, fuller bodied cigars were just easier to taste. The milder sticks I now enjoy are much more complex to me than most full bodied sticks. So, I've grown into mild cigars. I kinda shake my head at people who say they'll never smoke mild cigars. Some of the best cigars I've had were a mild smoke on a Saturday Morning. That being said I tend to like milder cigars in the morning and fuller bodied cigars in the evening. It's interesting, because while Patrick and I were at the IPCPR show last weekend, we encountered two distinct attitudes among manufacturers: those that were intentionally blending all of their lines a bit stronger and fuller, and those that were sticking to their guns — mild-bodied, medium-bodied, full-bodied, or otherwise. Among the makers turning out fuller sticks, the most common rationale given was "We are responding to the increased consumer demand for fuller-bodied cigars." But you have to wonder: which came first, the demand for fuller cigars, or the marketing pushing fuller cigars and thus creating such a demand? It's quite the chicken-and-egg scenario, and I wonder where (and, indeed, if) it will end. I'm all for full-bodied cigars, but I'm also a big fan of variety. I'd hate to see the market oversaturated with full-bodied cigars in the coming years. And I'd hate to see milder cigars die out or be phased out in a misguided effort to push the "fuller is better" agenda. One also has to remember, mild is merely subjective. I might find a cigar to be mild in body, while others find it to be medium or even full. Many people confuse full-flavored with full-bodied. A mild-bodied cigar can be very complex, offering a full-flavored profile. For example, if somebody notes a hint of spice with each draw, or some pepper on the finish, they might instantly classify that cigar as fuller-bodied. I think what the true enthusiast looks for is complexity, as his or her palate progresses. While Macanudo Cafe is a fine cigar, it does not contain the complexity necessary to keep the avid and sophisticated enthusiast satisfied. Another thing to remember…it is very difficult to introduce a new, high-end mild-bodied cigar. The Davidoffs and Ashtons of the world own this small corner of the market. Makers know, people will pay good money for a new, complex, full-bodied cigar. Consider beer…a strong IPA or Belgium microbrew is often quite expensive…while brews with lower alcohol content from these same breweries maintain a lower price point. That's a very good point. Just as people sometimes confuse body and quality, people often confuse body and flavor. Flavor and body are not the same things; mild-bodied cigars can be complex in flavor, and full-bodied cigars can be unsubtle and uncomplex, or vice versa. "Body" is, roughly speaking, the intensity with which the cigar's flavor presents itself. It is a level of amplitude, so to speak. For instance, if I were to mix one part orange juice and one part water in Glass A, and one part orange juice with two parts water in Glass B, both Glass A and Glass B would have the same flavor (that of orange juice). But Glass A would have a stronger "body" than Glass B. But that's an example in which all things, other than intensity of flavor, are equal. When comparing cigars, we must keep in mind that not all things are equal. 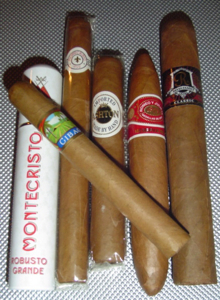 Different cigars have very different flavors, and different cigars have very different bodies. Flavor can and should be one of many determinants of quality when judging a cigar. Body, however, is not; it is simply a measure of intensity and not of quality. "Strength" is another word that most of us use interchangeably with "body," and I'll confess to having done so many times on this site and elsewhere. Technically speaking, however, strength and body are not the same thing. Strength is supposed to refer only to the potency and level of nicotine in a cigar's tobacco. Ninety-nine percent of the time, full-bodied cigars are also stronger than milder cigars, but this is not by necessity the case. Jon, thank you for your post! And to everyone for their very insightful responses. As you noted, everyone's palette is unique and therefore two enthusiasts smoking the same cigar may have very different experiences not unlike food and wine tasting. My personal preference is a full-flavored cigar that offers a smooth, balanced complexity and multiple taste nuances. Davidoff provides this very experience throughout their entire product line from the Classic to the Mille Series', from the Grand Cru to the Aniversario Series', and the Special Series to the Millennium Blend Series. The Classic No. 2 is very flavorful and what many would consider "mild" by definition while our Aniversario No. 3 and Millennium Blend Toro are considered Davidoff's fullest-bodied offerings. Our world-renown Master Blender, Henke Kelner, strives to create blends that are smooth, complex and balanced–engaging all the sensory areas of both taste and smell–with a range in body to delight every palette. I'm conscious of pairing my cigars depending on a number of factors including time of day, whether it's my only cigar of the day or the first of 2 or 3, my beverage of choice at the time or the meal that I will or have enjoyed. Of course, the parameters are different for everyone–part of the beauty of cigar smoking! The premium product lines from the House of Davidoff include: Davidoff, the annual Davidoff Limited Edition, Zino Classic, Griffins, Winston Churchill, Zino Platinum and Avo. Here's to enjoying the good life! Great post, Jon. I almost always go for something mild or mild-medium with morning coffee. PLPCs, Fonseca Delicias, or something CT shade-wrapped like an LTC or Gran Habano #1 is perfect while clearing the cobwebs. I'd recommend those smokes to anyone, anytime.